Our English interpretation of this Italian classic often lacks some traditional ingredients. In Italy minced prosciutto fat or pancetta is added to the Ragu. Even a little minced streaky bacon will help to give that special depth of flavour. To feed four people first make the Ragu. Heat 50gms of butter in a heavy pan, add the pancetta, bacon or prosciutto fat with finely chopped carrot, celery and onion. Cook gently without browning for about 10 minutes. Next, stir in 200gms lean minced beef or 100gms beef and 100gms minced pork. Cook for a further 15 minutes. Pour in a glass of red wine letting it bubble for a minute or two to evaporate the alcohol. Add a tin of tomatoes or a little good stock and tomato puree to loosen the mixture. Stir well and then allow simmer for I ½ hours adding more stock during cooking if the mixture begins to look dry. Taste and then add seasoning, maybe some salt and freshly ground black pepper. Put 500gms of tagliatelle in boiling water and cook till al dente. Strain the pasta, retaining a little of the water. Rinse the pasta and reheat with olive oil and a little of the reserved water. 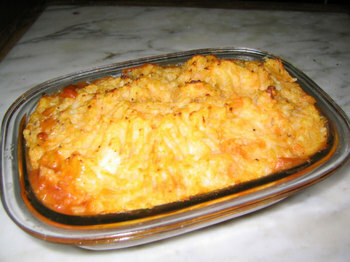 Serve with the Bolognese Ragu, grated Parmesan cheese and a green salad. To feed six first cut up 900gms of really good, lean stewing steak together with 300gms of ox kidney. Brown the meat quickly in batches in hot oil. Remove each batch from the pan with a slotted spoon and set aside. Chop a large onion and a couple of shallots and a scrap of celery or celeriac if you have it. Fry gently then, having poured off the excess fat, deglaze the pan with a generous glass of red wine making sure you scrape up all the residue into the bubbling wine. Mix about 300ml of stock or water with a generous teaspoon of cornflower and add to the pan. Bring to the boil stirring continually, return the meat to the sauce and put a lid on the pan. Cook gently for one and a half to two hours depending on the quality of your beef in a moderate oven. Meanwhile to make the Suet Crust mix 350gms of self raising flour with 175gms of prepared suet, 1 teaspoon of baking powder and half a teaspoon of salt. Add enough water to make a stiff dryish dough. Take a 1.75 litre basin and line it with the suet pastry remembering to keep a piece for the lid. 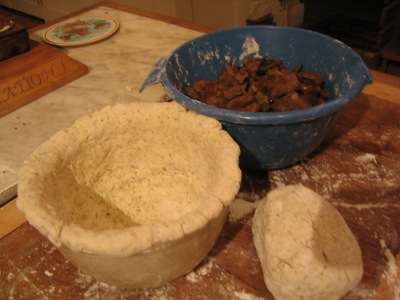 To line the bowl roll out a circle, flour it well and fold it in half. Push up the sides to make a flat bowl shape and continue to roll until it looks as if it will fill your bowl. Lift it carefully and open it up and put it into place. Press it gently against the edge of the bowl. Now roll out your lid and set aside. When the meat is tender fry 275 gms of mushrooms in a little oil. Stir them into the cooked steak and kidney. This is the moment to add the oysters if you really want to be authentically Old English! Really delicious! Now carefully spoon the filling into the basin and cover with the pastry lid, sealing well by wetting the rim. To take a large piece of baking foil and fold making a large pleat to allow you pudding to swell during cooking. Cover the pud with this and a pudding cloth. Secure with string. Place it in a steamer if you have one or in a pan of water on a little trivet or on top of an upturned saucer. Cover and simmer for 1 ½ hours. Take the cooked pudding from the pan and wrap in a crisp white napkin, in the traditional way:; serve the pud from the bowl! Bon appetite! I always cook the steak and kidney filling first, then make up the pie. First I brown 500grms of diced beef skirt or chuck steak in hot oil, then remove from the pan into a heavy lidded casserole pot. Next I brown the chopped ox kidney, having made sure all sinew has been removed. The kidney goes in with the beef. I heat a little more oil and soften three fat, finely chopped shallots, add a piece of celery, a few chopped parsley stalks and a couple of rashers of streaky bacon. All these add to the depth of flavour of the finished pie. I sprinkle a tablespoon of flour into the pan, give it a stir, and add a spoonful of tomato puree, red wine and home made stock. As it comes to the boil, stirring briskly, I deglaze the pan, then simmer for a few minutes, pour over the meat, add a bay leaf, cover the pot and place in a moderate oven. I let it cook gently, stirring once or twice, for two and a half hours. Cooking time will vary according to the quality of the beef. Don’t be tempted to boil hard, this will only toughen the meat. While it’s cooking I slice 350 gms of flat mushrooms and fry quickly in oil and a little butter. When it has cooled a little I put the steak and kidney and the mushrooms into a pie dish filling to the brim. I have a little old pie funnel which I put in the centre to let out the steam. Meanwhile you can make the flaky pastry if you’re really dedicated, I don’t! I buy ready made and enhance it with some extra butter, cheating I know, but so much quicker and really very effective. Simply roll out the pastry into a long strip, butter the centre section fold one third to the centre, butter again and fold again. Now roll out for the pie topping and as you do so, the extra butter will be spread throughout making a lighter flakier texture. Next wet the edge of the pie dish and cut a strip of pastry to go around the edge of the dish. Put it in place and now wet this too. Roll out the remainder of the pastry till it’s a little larger than the dish; make a cut in the centre of the pastry for the funnel and, using the back of the rolling pin gently lift the pastry on to the pie. Lower it gently onto the edging strip being careful not to stretch it. Press down round the edge and, holding your knife at ninety degrees, trim off the excess. Now seal the edges with the prongs of a fork, or crimp with your finger and thumb. Decorate your pie with traditional pastry flowers and leaves and brush with beaten egg. In days gone by when baking was done once a week the savoury pies were identified in the larder by their decoration. Put the pie in the ’fridge to rest the pastry, until you need it Bake in a hot oven until the pastry is crisp and golden, about thirty to forty minutes. Serve with boiled or mashed potatoes, buttery vegetables or a green salad. Let’s start with a traditional Sunday roast! A fillet of beef, a piece of sirloin or a rib caramelised on the outside and pink in the middle served with good gravy, Yorkshire pudding, fresh horseradish (grated into clotted cream!) and seasonal vegetables must surely be one of our best national dishes. Rub the meat all over with olive oil and sprinkle with a little salt and pepper. Place in a robust roasting tin and place in a very hot (preheated!) oven 220C/Gas 7 for 20 minutes to seal the meat and give you that dark rich coating to the meat. Reduce the heat to 180C for remaining cooking time. This will depend on how well cooked you like your meat. Here is a rough guide to cooking times, but remember all cookers vary and you are the best judge of yours. When you are satisfied the beef is cooked to your liking remove it from the oven, take it out of the roasting tin and leave it in a warm place to rest for at least 30 minutes before carving. All roast meat benefits hugely by being rested after cooking. Resting allows the juices to settle evenly through the meat. It also gives you time to cook the Yorkshire pudding, finish off the vegetables and make the gravy. To make the gravy first pour off excess fat from the roasting tin then deglaze it with a little stock or vegetable water and , if you like, a dash of red wine. Mix a couple of generous teaspoons of corn flour with a little water and stir into the gravy over the heat. Keep stirring till it thickens and clears, add salt and pepper to taste. If necessary strain it through a sieve into a gravy jug. Topside and silverside make very respectable roasting joints too provided that the meat is well hung and the cooking is slower and gentler. Give the meat a quicker hot blast as above then lower the heat to 195C and cook the meat for 20 minutes per 500gm. Slow roasting will become braising if you add some vegetables and liquid and cover the pot. Deglaze the frying pan with 750ml of stock or 300ml water and 450ml stout. Bring to the boil and pour over the meat making sure it is covered. Cover and cook for 2 hours in the preheated oven 170C/gas3 or until the meat is tender. * traditionally bouquet garni is made up of a bay leaf, and two or three sprigs of parsley and thyme. To make the dumplings sift 100gms of self raising flour and mix with ½ teaspoon backing powder, ½ teaspoon salt, 50gms shredded suet and 2 tablespoons chopped parsley. Add enough water to make a sticky dough. On a floured board, roll the dough into small balls. When the meat is nearly cooked put the dumplings on top of the stew and cook a further ½ hour until they are double the size and cooked right through. It helps to baste them a couple of times during cooking. Serve the stew with a crisp green salad. This is the basic principle for all stews and ragouts. Ring the changes with your choice of vegetables, herbs and liquid. Red wine, garlic, bacon, tomatoes and orange rind will take you to a French Daube. Kidney, mushrooms and oysters will bring you back to Britain with Steak and Kidney and Oyster Pie or Pudding. Juniper berries, peppercorns, Parma Ham and white wine will give you Italian Stracotto. The pasty question is a vexing one! Should pasties be crimped along the top or flat like a fat bolster. Is the beef minced or chopped – must it be beef? Does carrot go into the filling or just turnip and onion? Mrs Beeton, 1926, adds baking powder to her pastry and gravy to the filling! “ Farmhouse Fare” 5/- 1956 slices the beef and makes pastry with butter. Even Jane Grigson finishes the pasty with a frill on the top. She does makes the pastry with lard though. A minefield! My Cornish mother-in-law’s son is quite adamant: you cannot get a proper pasty in Devon, not even Widecombe! His mother remembered, as a child at the beginning of the last century, pasties, big and bolster shaped, being made very early in the morning. They were wrapped in newspaper and packed into an old suitcase or box and carried to the fields by the farm workers. When it was time to rest and eat, the pasties were still warm, comforting to cold hands and empty stomachs. If times were hard the filling was more potato and turnip than meat. One end was often jam-filled for pudding, all washed down with a bottle of cold tea, then back to work. Make a short crust pastry with 12 oz plain flour, 6 oz lard, ¼ tsp of salt and a little water, put it into the fridge to rest. Chop 1 lb of chuck steak, 4-5oz onion, 3oz turnip, 8oz potato. Mix together with salt and plenty of pepper. Roll out the pastry and cut out two large circles, divide the meat mixture between the two. Brush the rim of the pastry with beaten egg then fold in half and roll over the edge to form a crescent.. Place the pasties on a baking tray, brush them with beaten egg and bake in a hot oven ( 6/400) for 20 minutes, lower the heat and continue cooking for approximately another 40 minutes. Eat hot or cold. Roasted Fillet of Beef with Herbs and Porcini, Wrapped in Prosciutto. As far as roasted meat goes, this is extremely fast and simple, yet decadently rich. 12 – 18 slices prosciutto or Parma ham. 1 good handful of dried porcini, soaked in around 285ml / ½ pint boiling water. 3 good knobs of butter. 900g / 2lb fillet of beef (preferably from the middle, left whole). 3 good handfuls of fresh rosemary and thyme, leaves picked and chopped. Preheat your oven and an appropriately sized roasting tray to 230°C / 450°F / gas mark 8. Make sure there are no gaps in between the laid-out slices of prosciutto. Chop one of the garlic cloves and fry it with the soaked porcini in 1 knob of butter for a minute. Then add half of the soaking water (make sure it is grit-free). Simmer slowly and reduce for around 5 minutes before stirring in a squeeze of lemon, the remaining 2 knobs of butter and seasoning. Rub your tasty and moist mushrooms over half of the laid-out prosciutto. Season your fillet of beef and roll it in the herbs. Place it on the mushroomy end of the prosciutto and slowly roll up the meat. Once the beef is rolled up, pull off the paper and push in the ends of the prosciutto to neaten. Lightly secure with 4 pieces of string. Place the fillet in the hot roasting tray with a couple of cloves of garlic and cook for 25 – 30 minutes (rare), 40 minutes (medium), 50 minutes (well done). Half way through, add the wine to the tray. When the meat is done, remove it to a chopping board and leave to rest for 5 minutes. Pour any juices back into the roasting tray. Simmer the juices on the hob, scraping all the goodness from the sides of the tray. Remove from the heat and serve as light red wine gravy. Slice the fillet as thick or as thin as you like and serve with some potatoes and greens. Reserve a little of the porcini to serve with the greens.